Jeff, 27 Apr 2012The N9 was the top ph by daily interest at GSM until very recently. But just now I noticed th... moreGSMArena i think did some changes to the voting system,soon after i see terrible ratings for it, or maybe many trolls voted down against it,it's great device , no question about that. Jeff, 27 Apr 2012The N9 was the top ph by daily interest at GSM until very recently. But just now I noticed th... moreMaybe because of the os. Meego won't have support or development, that may scare people off. I like the design of this phone, may actually get it and use it as my travel phone. Sa Ra, 28 Apr 2012thanks mate,,,,if u found any app for lock messages pls leave a comment thanksYou are welcome. Ok.I'll post it here. You can do one more thing like I'm doing. The best and up to date website is my-meego.com. I've set up RSS feeds for that website. So, if any new app appears I'm being notified on my N9. Here I'm going to share a useful trick. As we know there is no app available to hide data from gallery. So, here is a trick which can work. Go to your file manager like"Filebox". In MyDocs crest a new folder but the name of the folder must start with a "dot" like ".personal" ".private" etc. This folder will be visible just I'm case if you have enabled the show hidden files from settings. Now whatever data you want to hide move it to this folder. Remember move it not copy it. When data is moved successfully close the file manager and go to gallery and Voila your data will not be showing in gallery. AnonD-51795, 28 Apr 2012Thanks a lot Miteka & Ch.Saqib.u both rock,specially Ch.Saqib for replying most of the que... moreThanks a lot for appreciation. Thanks a lot Miteka & Ch.Saqib.u both rock,specially Ch.Saqib for replying most of the queries... it helped a lot... N9 rockksss...Awesome phone..Proud to be an N9 user. AnonD-49722, 28 Apr 2012finally, n9 become the top tenDear miteka, by staying on this page writting comments will not raise the daily interest. You need to get out and come back in to advance interest by one count. Alternatively, you have to refresh page to yeild same effect. Need to vote too. Cheers. 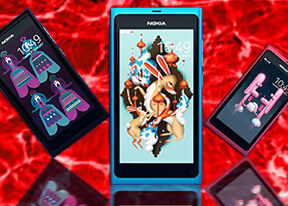 we think meego and nokia n9 is the best couple, (can you imagine sgs2 with meego OS? ), meego OS can run even in the middle hardware (e.g. single core proccesor clock at 1 ghz), unlike android (ICS) that must run in the high end hardware (e.g. dual core processor clock at 1,2 ghz). and because of this, many people become afraid if n9 will destroy android, iOS and other OS, so n9 must be destroyed first before it will destroy other. Jeff, 27 Apr 2012Are you sure they weren't thinking about an update to the Facebook client for Symbian? Often ... moreWhat can I say about that? They mailed me this and also on the call the representative confirms it..